Welcome to the official JC's Place app. Check out all kinds ofinteresting content and share it with others in your life. 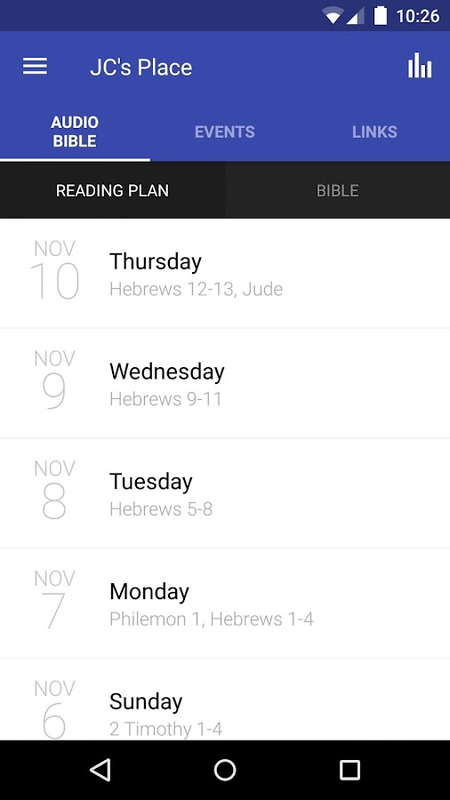 The JC'sPlace Ministry App was created with the Subsplash App Platform. Welcome to the official Jesse Duplantis Ministries app.Download ourfree app to have access to our monthly magazine (Voice of theCovenant), TV show (including past broadcasts), meeting info, ourexclusive web-only show, "This Week with Jesse", and more!Getencouraged and be inspired with daily testimonies. View encouragingwords to you on Facebook and Twitter throughout the day, withouthaving to leave the app! And after you’ve enjoyed your stay, youcan share it with your friends via Twitter, Facebook, and email.Formore information about Jesse Duplantis Ministries, pleasevisit:http://www.jdm.org/The Jesse Duplantis Ministries App wascreated with The Church App by Subsplash. Quickly access a large and growing library of trusted Christiandiscipleship resources from OnePassion Ministries, the preachingand teaching ministry of Dr. Steven J. Lawson. This app includeshundreds of resources from over three decades of pastoral ministryfrom Dr. Steven J. Lawson. All dedicated to developing Christiandisciples and training men in the form of biblical expositorypreaching. Quickly access: - The weekly podcast, Expositor -Articles and videos - Decades of sermons from Dr. Steven J. Lawson- Popular articles from Expositor magazine - The latest featuredposts from the OnePassion blog - Speaking and conference eventinformation - Information on The Institute for Expository Preaching- and more The OnePassion app allows you to: - Download audiomessages for offline playback - Easily access articles, blog posts,and articles from Expositor magazine - Browse our library by topicand scripture reference - Airplay audio and video messages toconnected devices - Receive notifications about the latestOnePassion resources and ministry initiatives The OnePassionMinistries App was created with the Subsplash App Platform. Welcome to the official Paula White Ministries app!Featuring thePaula Today television program, and sermons delivered at NewDestiny Christian Center by senior pastor, Paula White. Watch,listen, and share with friends via Facebook, Twitter, or email.Formore information about Paula White Ministries, please visithttp://www.paulawhite.org/The Paula White Ministries App wascreated with the Subsplash App Platform. Welcome to the official Derek Prince Ministries application for theiPhone, iPod touch, and iPad.Check out all kinds of content thatinterests you. After you’ve downloaded and enjoyed the content, youcan share it with your friends via Twitter, Facebook, or email.WiFiinternet is required for iPod touch.For more information aboutDerek Prince Ministries, please visit:http://www.derekprince.orgTheDerek Prince Ministries app was developed with the Subsplash AppPlatform. Welcome to the official Speaking Spirit Ministries application forthe Android.Listen to sermons on Bible passages or topics thatinterest you. After you’ve downloaded and internalized the content,you’ll want to share it with your friends via Twitter, Facebook, oremail.For more information about Speaking Spirit Ministries, pleasevisit: http://speakingspirit.orgThe Speaking Spirit Ministries Appwas developed with the Subsplash App Platform.App: © 2017 TheChurch App, Content: © 2017 Speaking Spirit Ministries. All rightreserved. Our mission is to fulfill the commission that Jesus Christ gave toHis followers to go into the world and make disciples of allpeople. Our purpose is to save the lost and to build up andencourage those who are already believers. We pledge to our viewersand supporters to take “All the Gospel to all the world and to allgenerations. William Franklin "Billy" Graham Jr. KBE (born November 7, 1918) isan American evangelical Christian evangelist, ordained as aSouthern Baptist minister, who rose to celebrity status in 1949reaching a core constituency of middle-class, moderatelyconservative Protestants. He held large indoor and outdoor rallies;sermons were broadcast on radio and television, some still beingre-broadcast today. In his six decades of television, Graham isprincipally known for hosting the annual Billy Graham Crusades,which he began in 1947, until he concluded in 2005, at the time ofhis retirement. He also hosted the popular radio show Hour ofDecision from 1950 to 1954. He repudiated segregation and, inaddition to his religious aims, helped shape the worldview offundamentalists and evangelicals, leading them to appreciate therelationship between the Bible and contemporary secular viewpoints.Graham has preached to live audiences of nearly 215 million peoplein more than 185 countries and territories through variousmeetings, including BMS World Mission and Global Mission. He hasalso reached hundreds of millions more through television, video,film, and webcasts.Graham was a spiritual adviser to Americanpresidents; he was particularly close to Dwight D. Eisenhower,Lyndon B. Johnson (one of Graham's closest friends) and RichardNixon. He insisted on integration for his revivals and crusades in1953 and invited Martin Luther King, Jr. to preach jointly at arevival in New York City in 1957. Graham bailed King out of jail inthe 1960s when King was arrested in demonstrations. He was alsolifelong friends with another televangelist, Robert H. Schuller,whom Graham talked into doing his own television ministry. He wasalso the founder of the Crystal Cathedral in Garden Grove,California, where the Hour of Power program was laterbroadcast.Graham operates a variety of media and publishingoutlets. According to his staff, more than 3.2 million peoplehave responded to the invitation at Billy Graham Crusades to"accept Jesus Christ as their personal savior". As of 2008,Graham's estimated lifetime audience, including radio andtelevision broadcasts, topped 2.2 billion. Because of his crusades,Graham has preached the gospel to more people in person than anyonein the history of Christianity.Graham has repeatedly been onGallup's list of most admired men and women. He has appeared on thelist 60 times since 1955, more than any other individual in theworld. Grant Wacker reports that by the mid-1960s, he had becomethe "Great Legitimator"
Dr. David Jeremiah, founder of Turning Point Radio and TelevisionMinistries and senior pastor of Shadow Mountain Community Church,felt God’s calling on his life at a very early age. Born February13, 1941 in Toledo, Ohio, Dr. Jeremiah was raised in a familydeeply committed to ministry. At the age of eleven, Dr. Jeremiahand his family moved to Dayton, Ohio where his father, Dr. James T.Jeremiah, was the Pastor of Emmanuel Baptist Church, and in 1953became the President of Cedarville College in Cedarville, Ohio.AsDr. Jeremiah was sensitive to God’s leading in his life, hefollowed in his father’s footsteps. In 1963, Dr. Jeremiah receiveda Bachelor of Arts from Cedarville College. In that same year, Dr.Jeremiah married his college sweetheart, Donna Thompson who alsowas attending Cedarville College as a business major. He went on toearn a Masters degree in Theology from Dallas Theological Seminaryin 1967. He completed additional graduate work at Grace Seminaryand was granted the Doctor of Divinity degree from CedarvilleCollege in 1981.In 1969, Dr. Jeremiah began Blackhawk BaptistChurch in Fort Wayne, Indiana, and developed a Christian schoolgrades K through 12. In the 12 years he served as pastor, BlackhawkBaptist Church grew from 7 families to 1300 members. He alsolaunched The Bible Hour television program.